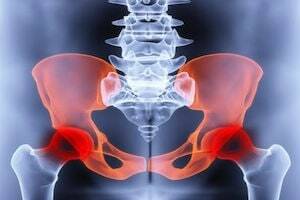 Pelvic fractures are as serious an injury following a motorcycle or bike accident as can be sustained and unfortunately are all too common in even moderate impact collisions. They can be devastating to the accident victim and cause long term problems affecting mobility. Having seen my fair share of these cases as a personal injury attorney in Los Angeles, CA, I thought I would explore the causes, treatments and prognosis for recovery from this type of bodily harm and why it is best that victims retain a lawyer in these cases. The pelvis or pelvic girdle is the bony structure of the human body that connects the lower spine (including the coxal bones, sacrum and coccyx) to the upper leg bones (femurs or femoral heads). Essentially, it functions to connect the “back bones to the leg bones”. Where it flares out at the top is commonly known by most people as their “hips”. It is one of the largest bones of the human body and is essential for balance associated with gait which affects walking, running, and overall lower body mobility. Why are Hip Fractures so Common in Motorcycle and Bicycle Collisions? Because the pelvic cavity is such a large bony area, it takes a major impact to the hip region to cause a fissure in the bone. Unfortunately, because of the dynamics of bike accidents, this type of impact is not uncommon following a motorcycle or bicycle mishap. In broadside collisions, which are common in and around intersections, the motor vehicle can actually directly contact the hip region of the biker. Other times, the two wheel rider gets ejected from their bike and the pelvis impacts with the hard asphalt or concrete pavement or sidewalk, causing the breakage. The bottom line is that persons on motor bikes, mopeds, scooters or any type of cycle have very little protection in and around the hips. Most bikers wear helmets, at a minimum. Many motorcyclists also wear protective leather gloves, chaps, jackets or skid pads as well. Very few, if any, riders wear any type of protective gear in and around their hips. This leaves the area exposed for blunt force trauma. Results and Medical Complications From Pelvic Fractures? Due to the importance of the pelvis for stabilizing the lower body, pelvic fractures can have a major impact on a person’s ability to walk, jog, run, or ambulate in any way. Sometimes the fractures are not severe and will require a person to be off their feet for a brief period but, more significant cleavage of the bones can result in major downtime. In addition, this can cause major strain and pain to the legs, lower back and groin area. This can affect one’s ability to work, lift, exercise, conduct household chores and just about every other aspect of daily life. While so-called “stable fractures” (i.e. mild pelvic injury with only one breaking point along the pelvic ring) can sometimes heal on their own, surgery is the most common means of repairing a mild to serious break especially “unstable” fractures (i.e. multiple regions with large internal derangement of the bones and surrounding tissue and usually coupled with moderate to severe internal bleeding). The orthopedic surgeon oftentimes must re-connect the bones with internal fixation by inserting metal hardware including screws and plates to re-stabilize the area and allow for healing. Sometimes this hardware must remain in the patient. Other times, a follow up surgery is done to remove the metal plates and screws. In some cases, where healing is not forthcoming, bone grafts and other more serious surgical intervention may be required. Unstable fractures have been shown to cause longer term, residual pain or other complications like long-term loss of mobility in about 60 percent of patients. Why is it Important to Retain an Experienced Motorcycle or Bike Accident Lawyer Following a Hip Fracture? Any person who sustains this type of harm following a motorcycle or bicycle collision as the result of motor vehicle negligence caused by another driver should absolutely retain the services of an experienced personal injury attorney. These types of significant bodily injury claims rarely settle for full value absent a legitimate legal work up which, most often requires litigation of the case in court and allowance for extensive “discovery” including defense medical examinations and the deposition of the injured person (“plaintiff”). The victim needs to fully recuperate from their injury and stabilize before any meaningful settlement discussions can take place. Sometimes, full mobility is not achieved even following post-surgical rehabilitation. This leads to high costs of medical expenses for the initial trauma care, surgeries and physical therapy. It also leads to major life disruption which can be short, medium or long-term and, sometimes, even permanent. To obtain the maximum amount of compensation for medical costs, lost wages, and “general damages” for past, present and future pain, suffering, anxiety, emotional distress, and disruption of lifestyle that is caused from losing partial or full mobility for any length of time or permanently, one must be willing to fully prosecute the claim up to and through trial, if necessary. Southern California is home to more bike and motorcycle incidents than just about anywhere in the U.S. and these cases rarely settle without serious and experienced legal representation. Therefore, it is best to hire a personal injury lawyer familiar with the laws and court system in the Los Angeles, Orange County, San Diego and Inland Empire region when it comes to pursuing justice for the victims.